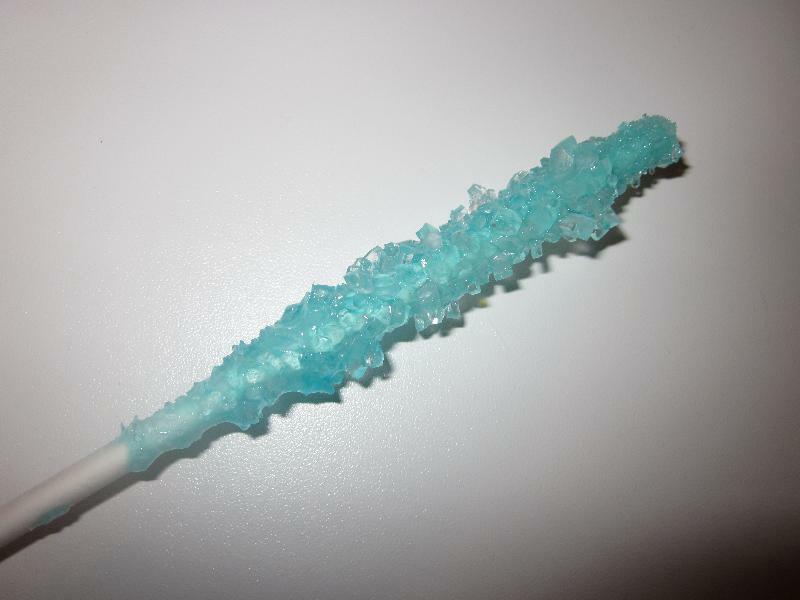 My son loves rock candy! As a kid I always tried to make it but it never worked. This recipe that I found here works! We tried two methods. One with a string and one with a lollipop stick. The stick was much more successful! Cut a piece of thread a few inches longer than the height of the glass or jar. Tape it to a pencil. Place the pencil across the top of the jar. The thread should hang about an inch from the bottom of the jar. Next attach a paper clip to the bottom of the thread to act as a weight. Or you can use a wooden skewer or a lollipop stick. Then wet the thread of stick and roll it in granulated sugar. This will give the sugar crystals something to hold onto when they start forming. Next place the water in a pan and bring it to a boil. Then start adding the sugar, one cup at a time, stirring after each addition. Continue to stir and boil the syrup until all of the sugar has been added and is dissolved. Now add 2-3 drops of food coloring. Let the syrup cool for 10 minutes and then pour it into the jar/glass. Lower the sugared string/stick into the jar/glass. Place your jar/glass in a cool place away from lights where it will be undisturbed. Cover it loosely with plastic wrap or a paper towel. Sugar crystals should start forming in 2-4 hours. If there is no change try boiling the syrup again and dissolve another cup of sugar into it. Pour back into the jar/glass and add the string/stick. Remove it from the jar/glass and allow it to dry for a few minutes and then enjoy!